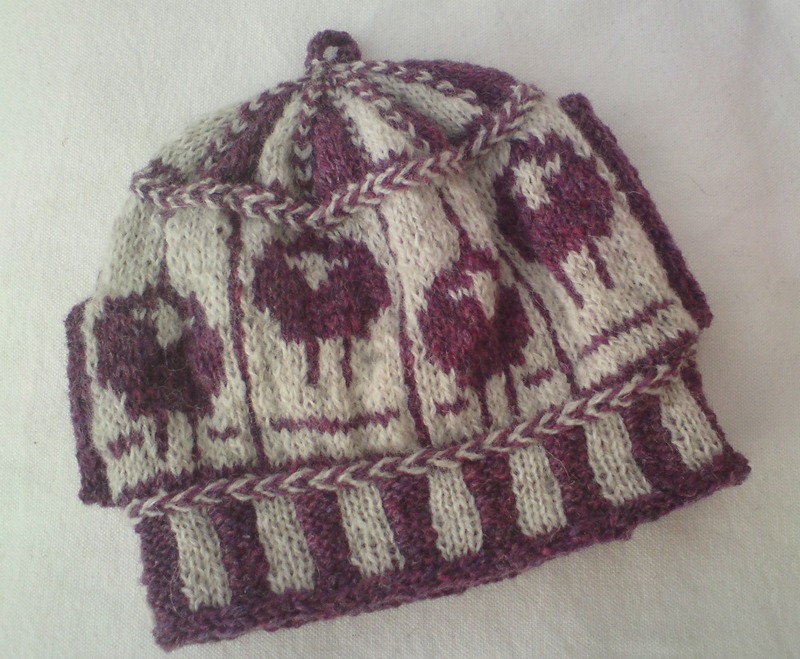 We're having a Knit A Long for Kate Davies' Sheep Carousel... a tea cosy packed with techniques. 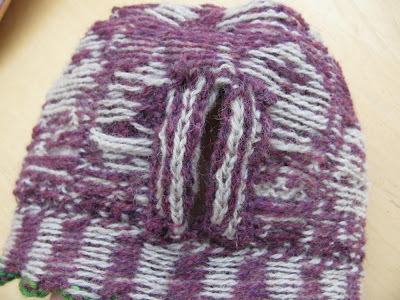 After the steeks we need to fold back the flaps and stitch them down to the inside of the tea cosy. (Fiona) I used the purple yarn and was careful to sew it to the back of the stitches (the bumps) and not the floats. Also don't pull too tight or it could pucker. I took the opportunity to tidy up any ragged ends too... in particular at the top of the steek. 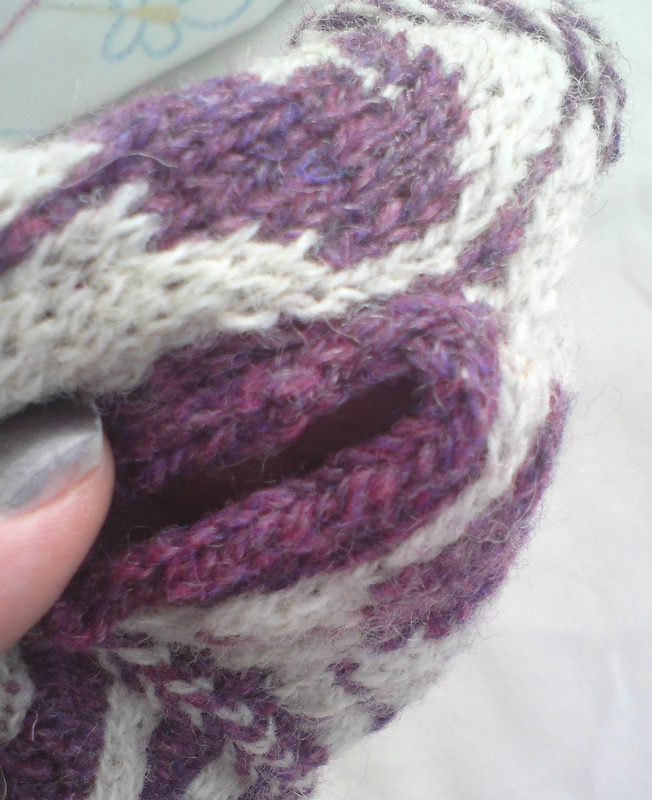 Next step is to pick up and knit stitches around the spout and the handle holes. I wasn't sure where to pick up the stitches... You'll see when you come to it that you have one line of purple stitches on one side and two lines on the other side. 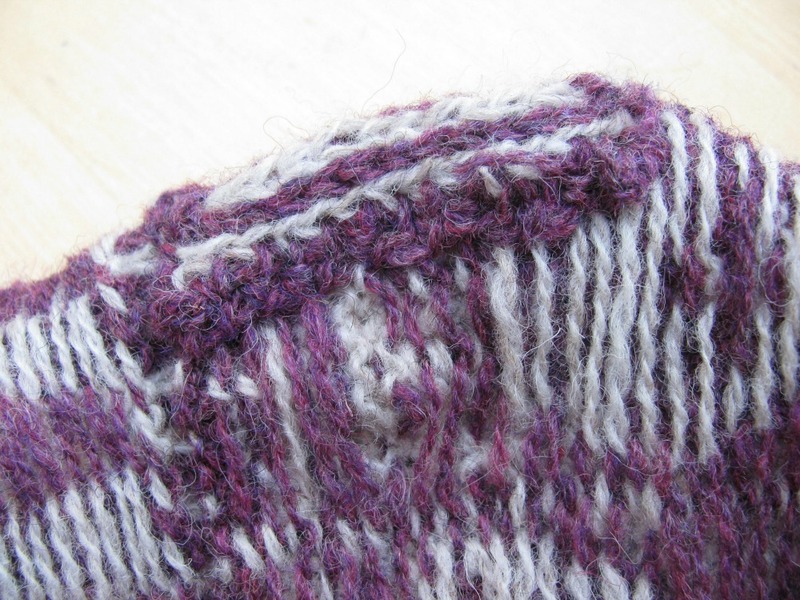 I chose to pick up stitches so that only one line of purple stitches framed the bind off. 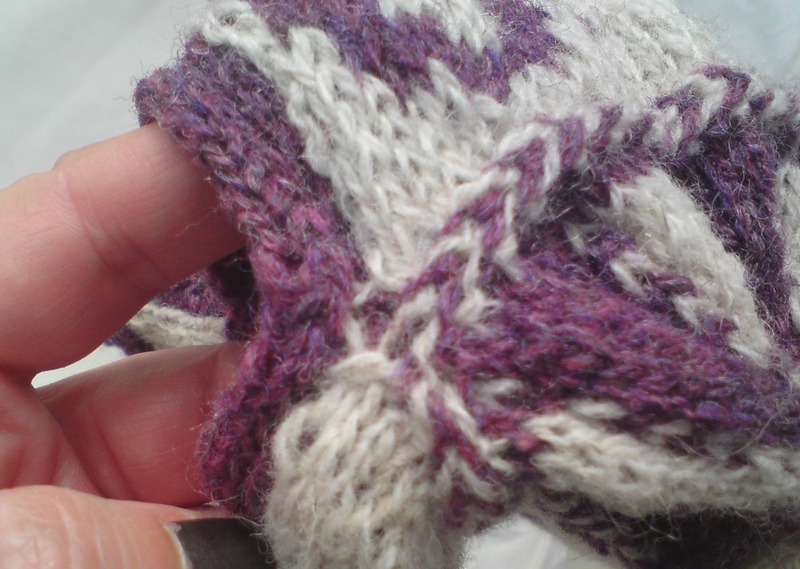 You can see a video here by Knit Picks about picking up stitches. It is rare for me to manage to pick up the 'correct' number of stitches and as usual I picked up more than recommended by Kate... 30 on the spout and 40 on the handle. It doesn't appear to made any difference and looks straight and neat regardless. I used 3mm double pointed needles. The bind off instructions left me confused. I have seen someone do one before but this was a different technique to that. A quick google revealed this video by knittingtipsbyjudy which matched Kate's instructions and made it much clearer. I joined the edges of the bind off using a kind of mattress stitch to make it 'look' seamless and hid all my ends inside the steek flap. I then finished off with another i cord bind off. I must have done the crochet cast-on wrong, as I found the unpicking a nightmare and the stitches were all twisted. Also, if I do this again I will NOT use 4 ply sock wool as it started to mat with the cosy wool, and every time I pulled the waste yarn through the live stitches I was worried the live yarn would break, it is quite fragile when being pulled. I'll use cotton or something slippery instead. Illustrious Naturals in the shop! Erika Knight Wool Local in the shop! My Mama Knits trunk show! 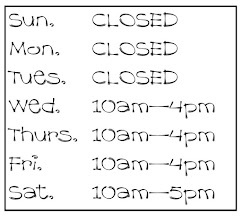 All original images and text on this website are copyright and the property of The Woolly Brew.. Simple theme. Powered by Blogger.